“Taar,” the moustached man called out. Wearing an ill-fitting brown pant, and a shirt a cross bag and a brown cap a left over from the british civil services. He was a must in every hindi movie. It created melodrama, the twist in the tale, sometimes even the key knowledge. I remember as a kid, one village woman walking up to great aunt Ratna, howling away in a crescendo, on inquiry it turned out that she received a telegram. The understanding was a telegram meant a bad news. Writing a telegram then was equivalent to typing an SMS where you are billed by the words. Weddings had a person who was in charge of receiving telegrams. Journeys ended with telegram, sending back a message of the safe arrival of the traveller. For 163 years, telegraph dept. Has been part of indian communication. We now put it to rest. I wish I could have sent that last telegram, I would have sent it to my nephew Madhav who has never received a telegram in his life. maybe he does not even know what it is. As matter of fact neither does my 16yr. Old know. 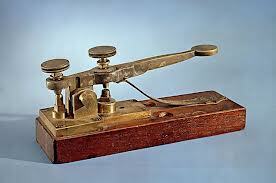 1850 saw the launch of telegraphs on experimental basis between Kolkata and Diamond Harbour. 1851 it was available for British East India Compnay and 1854 it became a public service. Cutting of telegraph lines to stop official communications was a part of revolutionary activity. It was the quickest means of communication and less expensive than telephones for a long time. Since telegrams were a govt. Registered communication, the Indian Evidence act had legal credibility. The advent of mobiles and SMS has eased out the world of telegram. Last night this yeoman service will cease to exist. Of course the Rs.100 crore required to manage it, despite of Rs75 lakh revenue was a big drain on the economy. The staff of 1,000 employees will be absorbed into mobile, telephones or broadband services of BSNL. The opposition would like to quote that economically challenged citizens needed the benefit of telegram, but the fact remains, (various mobile vendors will vouch for this) people of lower economic groups tend to invest in a high end mobile as it acts as a radio, and cassette player for them. So much so that many unaccounted businesses are on loading song clips, and mms clips to the mobile. With PCO and community phones those who are not owners of mobiles are also taken care off. Its like cutting a gangrene off your body. Next PostNext The rot within.